management extravaganza combined with research views to present and experience the upcoming and exotic trends in the field of Finance, HR, Marketing, International Business etc. The main objective of organizing the conference is to provide the platform for Eminent Academicians, Professionals, Industrialists, Research Scholars and students for shaping views, ideas and related Research and Development in the field of Management. International Conference on Emerging Trends in Computer Science and Information Technology, a technical extravaganza combined with research views to present and experience the upcoming and exotic trends in the field of Computer Science and Information Technology. 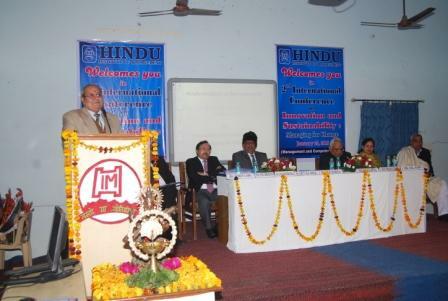 The main objective of organizing the conference is to provide the platform for Eminent Academicians, Professionals, Industrialists, Research Scholars and Students for shaping views, ideas and related Research and Development in the field of Computer Science and Information Technology. As The Complex business environment of today marked by tough challenges and greater opportunities, HIM took up the mandate of bringing together informed minds and delegates from varied industries and institutes to present their views and opinion on “paradigm shift in entrepreneurship”. It was also concluded that Entrepreneurship’spotential to support economic growth; it is the policy goal of many governments to develop a culture of entrepreneurial thinking. This can be done in a number of ways: by integrating entrepreneurship into education systems, legislating to encourage risk-taking, and national campaigns. The session was attended by delegates from industry and academic institutes and was hailed as a highly enlightening session by the attendants. The key speakers included Mr. Deepak Jindal, Project Leader, Accenture; Mr. Subhash Tyagi, Chairman, Gold Plus Group, Delhi; Mr. Vishal Shrivastva, Group Head-HR, Gold Plus Group; Mr. Mohit Grover, ASM, Net Ambit Insurance, Jaipur; Mr. Vinod Duhoon, CA, Danblock Brakes Pvt. India Ltd.
Primary objective of this conference was to establish an affective channel of communication between the vertical researchers and practitioners. Two of the emerging areas which will reshape the world in the twenty first centaury are Management and IT,The aim of the conference was to bring the researchers working in Web Mining,and other related areas under one umbrella to enable exchange of the advancement of these fields of Management and Technology.The Session was attended by delegates from industry and academic institutes and was hailed as a highly enlightening session by the attendants.The Key Speakers included Prof. Sudesh Singhal,Dean SGIT,Rohtak;Prof. Naseeb Singh Gill,Chairman,Deptt. 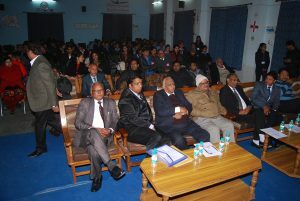 Of Computer Science,MDU Rohtak;Prof, N.P.Singh,Prof,MDI,Gurgaon,Dr.Shaifali,Deputy Director,UGC-ASC BPS Women University.Prof.Rajesh Bhatia,Professor,DCRUST,Murthal.